The WCATF is maintained mostly by annual assessments as well as by the interest that these assessment deposits earn in the State Treasury. The net premiums collected by the workers’ compensation carriers in Florida and the net premium applicable to the self-insurers in Florida (as promulgated by the Division) are the basis for computing the amount to be assessed which is expressed as a percentage of net direct collected premiums. Neither carriers nor self-insurers may deduct any cost of reinsurance. However, carriers may deduct dividends paid and refunds returned to policyholders in a given quarter. Assessments must be paid on deductible policy premium "addbacks" which is the cumulative dollar value of all premium discounts that were applied in connection with any deductible plans written during the reporting quarter. 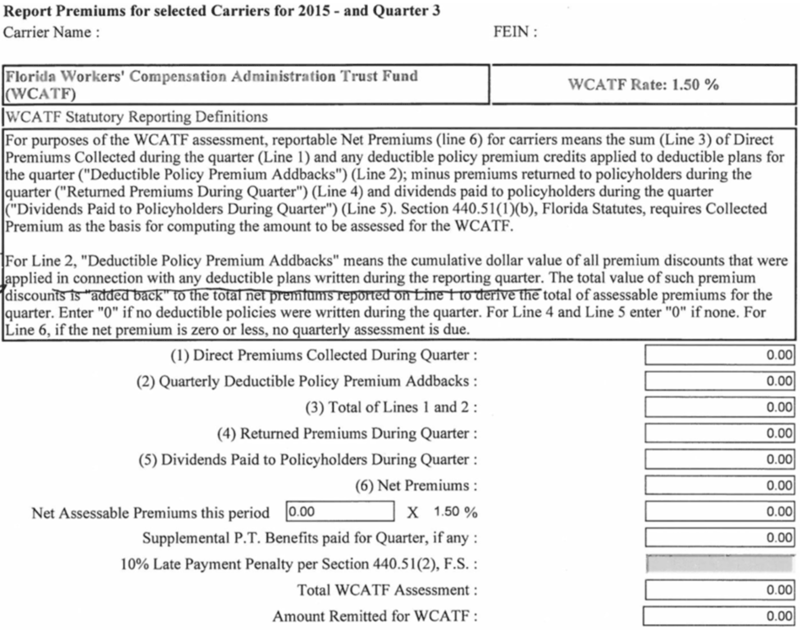 These total premiums are then applied to the current applicable WCATF assessment rate to determine the carrier’s quarterly assessment. Are the WCATF Assessments required? Who must pay the assessments? What does the WCATF provide or pay for? What are the bases of the WCATF Assessments? 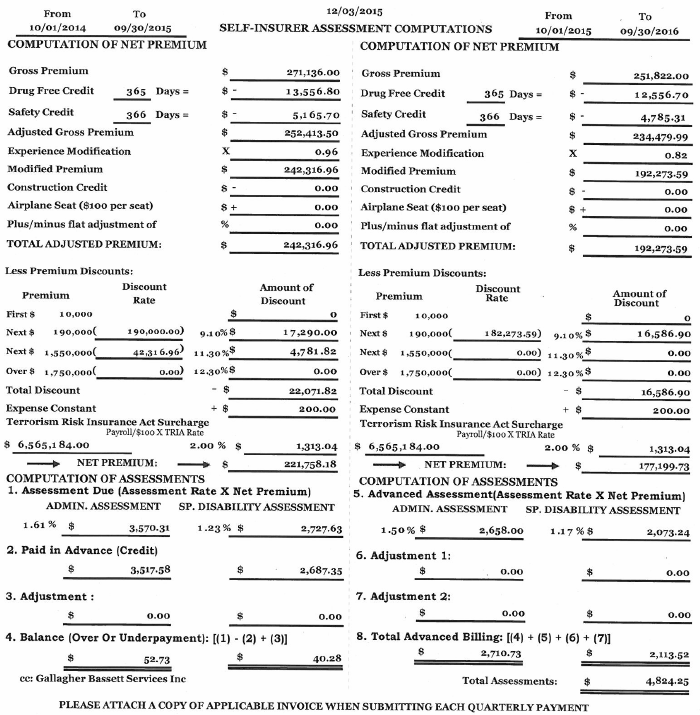 Can the WCATF reported premiums and assessments be audited? How is the WCATF Assessments Calculated for Carriers? How is the WCATF Assessments Calculated for Self-Insurers? Yes. The WCATF Assessment is required by Section 440.51, Florida Statutes. There is established in the Florida State Treasury a special fund to be known as the "Workers' Compensation Administration Trust Fund" for the purpose of providing for the payment of all expenses in respect to the administration of Chapter 440, Florida Statutes. The fund is administered by the Division of Workers’ Compensation. And the self-insurers under Chapter 440, Florida Statutes. These assessments shall become due and be paid quarterly as provided in Section 440.51, Florida Statutes, at the same time, and in addition to the SDTF Assessments. What are the premium bases of the WCATF assessments? The net premiums collected by carriers plus the discount that had been applied to any deductible plans and the amount of premiums calculated by the division for self-insured employers are the basis for computing the amount to be assessed by the WCATF. When reporting deductible policy premium for purposes of computing assessments, full policy premium value must be reported prior to application of deductible discounts or credits. Can the Division require additional documentation to support the reported premium? Yes, the Department may require reports from each carrier in respect to all gross earned premiums. How is the WCATF Assessment Calculated for Carriers? How is the WCATF Assessment Calculated for Self-Insurers?